Opened in November of 2013, River’s Edge has become the premier dining, gaming, and entertainment venue in Greene County. 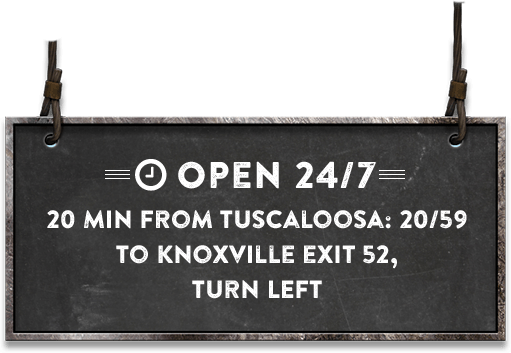 We’re only 20 miles from Tuscaloosa and an hour away from Birmingham, Alabama. River’s Edge is the ideal location for community gatherings, special events, and for families and friends to come and have a great time, either for a few hours or for the entire day. Our mission is to enrich and improve the lives of people in the community we serve, primarily through providing entertainment venues and services that involve our community to interact with their neighbors, friends, and family in a safe and fun environment. We invest in the betterment of our community through innovative, charitable programs and by supporting local organizations. River’s Edge offers more than 500 different games in our 30,000 square foot building. All the most popular games are under one huge roof for you to play the day away. From Bingo, Triple 7, Goddess of Fortune, Money Train, and Golden Rome to Gold Reef, Wheel of Riches, Clue Royal, and Magic Ball Keno, you’ll never be at a loss of thrilling games when you play at River’s Edge. Save your appetite for The Edge Bar & Grill – where you can enjoy everything from the best wings in the county to burgers, hot dogs, chicken, and more! In the mood for a great Philly Steak sandwich? How about a chili cheese dog with fries or our famous catfish strips? Whatever you’re in the mood for, The Edge Bar & Grill has it! All food is cooked to order for the ultimate in quality, taste, and freshness. Enjoy The Nick – grilled chicken tenders, bacon, American cheese, and mayo on toast, or order fries, okra, coleslaw, onion rings, and more from our sides menu and share with friends. Whether you’re in for a drink or you’ve brought the family in for a celebration dinner, The Edge Bar & Grill offers good food, good drink, and good times! Gaming works up an appetite – this we know, so the Edge Bar & Grill is open for you to regain your strength and enjoy all your favorite foods, without having to leave our gaming venue! Good Drinks: Whether you’re in to relax and unwind for the eve or you and your friends are out celebrating big, River’s Edge offers a full spirits menu to enjoy. Whether you’re in to dine, to drink, to watch sports, to play games, or to enjoy live entertainment, River’s Edge has all the makings of a great time, whether you’re in for a couple of hours or you spend the entire day with us.